Kodak EasyShare C663 zoom digital camera is the first camera to incorporate proprietary Kodak Perfect Touch Technology with creates better, brighter pictures by bringing out detail in shadows without affecting lighter areas. Kodak EasyShare C663 digital camera features 6.1 megapixel resolution, 2.5-inch color LCD screen, Schneider-Kreuznach Variogon 3X optical zoom lens, continuous 640 x 480 VGA video at 24 fps, and on-camera picture enhancing features. Steve’s DigiCams reviews Kodak EasyShare C663 zoom digital camera and concludes that Kodak C663 is a welcomed addition to their very poplar EasyShare line of entry- level consumer models. Offering good overall shooting performance, great image quality, and loads of user-friendly exposure modes, it’s sure to make a fun choice for anyone in the market for a capable 6-megapixel digicam. However, with a street price of about $299, it’s a bit expensive when compared to similar models by other manufactures. Imaging Resource concludes that Based on ease of use alone, Kodak’s EasyShare digital cameras are a beginning photographer’s dream. While that simplicity has long been Kodak’s hallmark, some of its latest models have been upping the ante with new features and functions not seen on entry-level models. The Kodak C663 is a good example of a camera with some kick. Where the Kodak C663 stumbles is in the details. Kodak Perfect Touch is a great concept that helped improve some of my images with low-light problems but finding and using the feature is harder than it should be. Also, it didn’t always perform up to snuff, particularly in images with high contrast shot at ISO 400 and above. Similarly, the camera struggled with low-light shooting in general, with lots of noise and softness in images captured at the high ISO sensitivities. There was also an overall sluggishness to the camera. Despite a few shortcomings, the Kodak C663 is a great camera for both a first-time user and for someone who wants a little more creative control of their pictures. 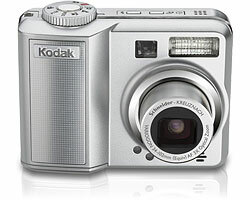 For more features, specifications and sample photos, visit Kodak EasyShare C663 official homepage (no longer available).